I point my finger at two culprits, but maybe they’re both one and the same: That Randian-libertarian notion that taxation is theft, plus that government regulation of the marketplace is also a kind of theft and anyone who advocates it is a moocher who wants a free lunch. I swam in libertarian waters for most of my twenties, until Reagan cured me of it, and I’m here to tell you there are a lots of useful tools in that pool who really believe the invisible hand of the marketplace will create a Heaven on Earth if we would only let it. Well…right up there is your Heaven. My little village made the network news about this one! It’s not like other parts of the city aren’t falling apart too, or for that matter other parts of other cities all over the country, but you can see how something like this unnerves even people who don’t live in the slums. Tornadoes, floods, earthquakes, my God those things can happen to the nice neighborhoods too. What strikes you listening to the chatter is how the little details that make things make better sense go missing from the conversation of people you don’t live in the vicinity. 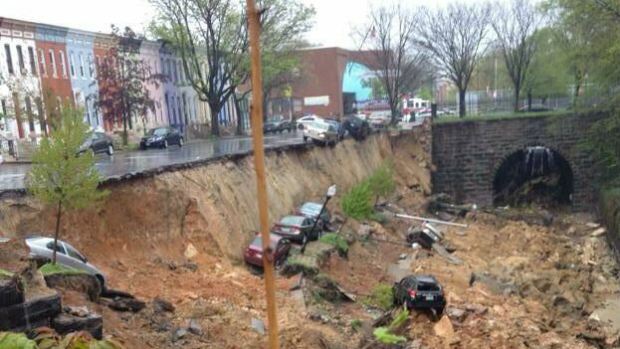 I saw several people talking about how Baltimore streets are sinking. Well, yes and no. One thing to understand about Baltimore is it kinda straddles the boundary between the coastal plains and the Maryland piedmont…those lovely rolling hills of Maryland. (Our oddly shaped little state is very diverse in its geography, and there is beauty everywhere) Parts of the city are actually way higher up than other parts but you don’t really notice how big the elevation changes are because they are gradual in most places, unlike say San Francisco, and you don’t see the grade change until you get somewhere you can look a distance. The streets and sidewalks gently slope up and down, up and down and the walk isn’t difficult and you look back and you notice the city core off in the distance is now almost entirely below you. The north-western part of the city is in the hills and the rest of it is on the coastal plains. That’s how my house can be something like 60 feet higher than the Jones Falls River even though on the map I look like I’m right next to it. In the 1890s what was the Baltimore and Ohio railroad, the first common carrier railroad company in the U.S., dug a bunch of tunnels and trenches through the city including one really big tunnel going under Howard Street, to connect with points north from its Camden station because that was actually the less expensive way to do it, compared with a surface line through the center of the city or going around the city. This is why now you might be walking along a city street and suddenly there’s this deep trench on the other side of a cast iron fence and it’s not one of our little rivers down there, it’s a set of tracks coming out of a tunnel. Building those tunnels and trenches bankrupted the company shortly after the lines opened up, and it was in receivership for about three years because the economy tanked and all their profit forecasts went down the tubes. It’s tough to run a railroad in bad economic times. It costs money to cut the grades a train can run, and lay some tracks down, let alone cut tunnels and dig trenches out of the middle of a large city. And then you have to maintain all that. But money is tight these days…for some reason…and everyone in the city who was here when the Howard Street tunnel caught fire in July 2001 knows what is going to happen now. People were complaining about the retaining wall that collapsed last Wednesday, years before this, and CSX kept telling them there was nothing to worry about. If it was ever inspected at all in the past decade I’m guessing someone didn’t want to tell the board of directors their yearly bonuses would need to be spent shoring up a hundred plus year old stone wall. Now CSX is probably going to sue the city for damaging its tracks and the city will sue CSX back for damaging its street…and so on and so forth. And none of it needed to happen. But it did, because what was fifty years ago a reasonable rate of return on investment is woefully inadequate today. We want our double-digit returns and we want them now. So the factories close and there is less for the rail companies to carry. So the businesses close because workers don’t make enough to buy things like they use to and there is even less for the rail companies to carry. So the economic heart of the cities shrivels, and with it, the city itself. (Reuters) – More than 63,000 bridges across the United States are in urgent need of repair, with most of the aging, structurally compromised structures part of the interstate highway system, an analysis of recent federal data has found. Meanwhile the banks and Wall Street keep demanding instant and ever higher returns on investment, and Grover Norquist wants to shrink government to a small enough size he can drown it in a bathtub. But government is a communal thing as in Community, and what is being whittled down to size is that sense of community, that we are all fellow Americans…neighbors. It is America Norquist and his pals are drowning in that bathtub, so they can feast without being presented a bill. And everyone is putting off maintenance because the money done all trickled up and the rising tide didn’t so much lift all the boats as sink the cars. And nature doesn’t care why you didn’t shore up the wall and improve drainage around it.